Alicia Wierschke, born in 1985, was raised in the small town of Greenleaf, Wisconsin, in the United States. She studied drawing and painting under John Gordon’s New Masters Program in Green Bay, Wisconsin from age 10 to 18. She then studied at Wisconsin Lutheran College in Milwaukee, Wisconsin and earned her Bachelor of Art in Art with an emphasis in Printmaking in 2008. 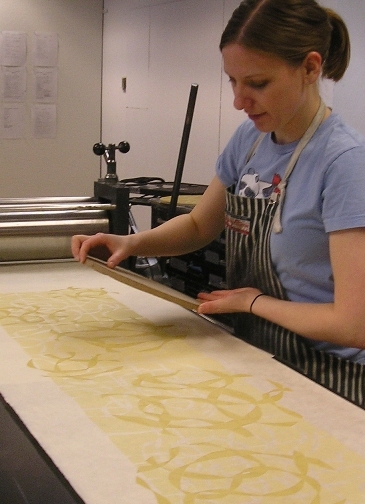 She then moved to Grand Rapids, Michigan and earned her Master in Fine Arts in Printmaking, specifically in woodcuts, at Kendall College of Art and Design in 2011. She is currently an instructor at Kendall College of Art and Design, and is exhibiting works across the United States. The inherent repetitive aspect of printmaking processes lends itself naturally to creating repeated forms in my prints. Due to my great interest in process this is inevitably intertwined with the form and content of my work. I primarily work in woodcuts, printing multiple blocks across the paper, and reuse the same blocks in other later prints using different colors and arrangements, thus mixing and matching the old with the new. Each print is slightly different - its own mono-print within the matrix I have created. I have established my own language through the wood blocks that I repeatedly use in my different pieces, which tell different stories depending on the color and composition. To me my signature forms of intertwining ribbons and tangled masses symbolize connections. These connections are the visual manifestations and literal ties I feel between others and myself. The ribbons may appear like DNA strands and tangled masses like cells. In that sense my forms are visualizing the basic stuff of life – the common denominator in living creatures and the cellular structure that unites us all. I print on lightweight paper and display the prints usually unframed to achieve a subtle, light, and ethereal look. My color use is intentional yet instinctual. I print predominantly neutral natural colors, often with much transparent medium added, to reflect the subtle and cyclical nature of the evolving world around us by which we are affected. Through my color choices in combination with my forms I slowly build up thin transparent layers that are quiet, serene, contemplative, and elegant. The pursuit of beauty does not seem to be an acceptable goal within the realm of contemporary art. While not always intending to strive for what is beautiful, I cannot force my work to be dark and ugly. My works are far too autobiographical and personal, and so they reflect myself through their quietness, calmness, and contemplativeness. I feel that my work has an elegant, tranquil power that is reflective of its creator. My work does not meditate on the darkest parts of the human condition, but is optimistic in contemplating what is good and hopeful. This quiet contemplation of beauty and optimism stems from the contentment in the hope of salvation I have as a Christian artist. While consisting of abstract forms, my work is extremely personal. A viewer may not completely understand my work due to its non-representation, but they will still be affected by its quiet elegance. The prints become symbolic in their emotional meditations, and I hope to strike a similar emotional cord within those who view it. 1. 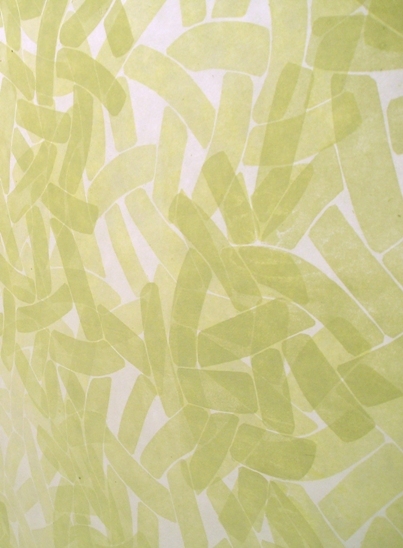 Detail of Untitled (Window I), Woodcut on Mulberry, 37 x 108 inches, 2011. 2. Detail of Untitled (Window II), Woodcut on Mulberry, 37 x 108 inches, 2011. 3. Untitled, Woodcut on Okawara, 39 x 36 inches, 2011. 4. 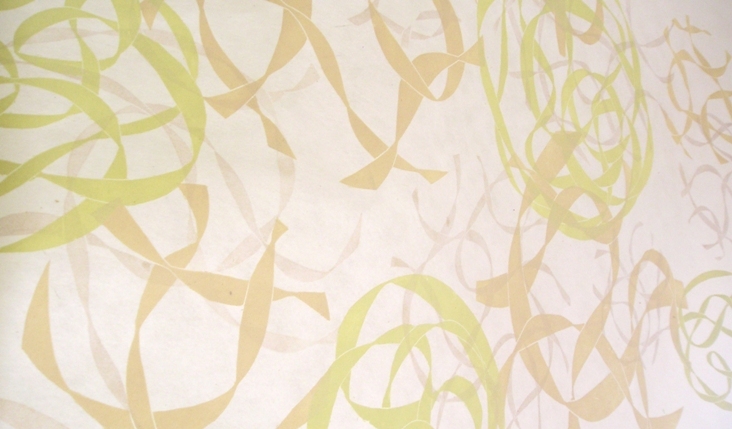 Untitled (January III),Woodcut on Okawara, 47 x 39 inches, 2011. 5. Untitled (Thaw III),Woodcut on Okawara, 38 x 36 inches, 2011.